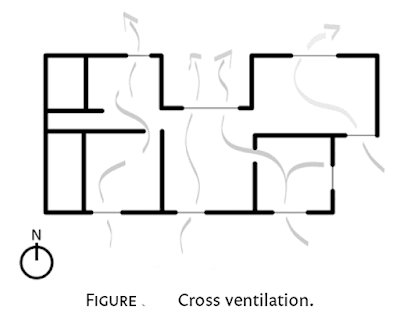 It is important to design your home with operable windows on the prevailing breeze side of the house (east or south sides, in Figure) and on the opposite side of the house for the purpose of supplying passive ventilation. e prevailing breeze creates pressure differences from one side of the house to the other. Strategically placed windows on the prevailing breeze side of the home and the opposite side work to draw the breeze through the living space. 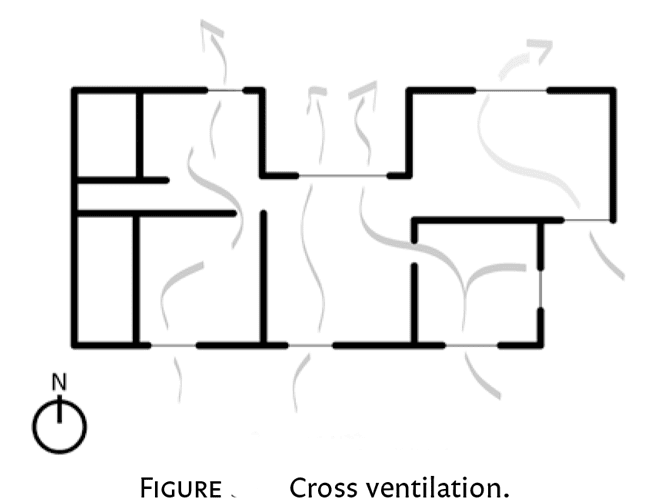 We can actually increase air ow through the space by opening more windows on the negative pressure northwest (downwind/leeward) side than on the positive pressure (southeast/ windward) side of the home. When wind currents travel through a constricted opening, the velocity increases (the Venturi effect). e Bernoulli principle determines that as the air speeds up, its pressure drops, causing it to create suction and drawing in even more air. The same principle can be applied to the architectural layout of the structure itself, using a vernacular breezeway or dogtrot design to channel breezes into the living space. To increase the breeze’s effective cooling, the alignment of the building sections can be o set at an angle. In this way, we can use smaller windows or openings on the windward side of the dogtrot and larger windows or openings in the dogtrot on the leeward side to pull air through the structure. Windows on the side walls of the dogtrot are used to channel that increased volume of air into the living space of each building. Thanks for this informative blog as I was searching for so long time.